Discover over 2 million specimens under one roof, including the largest blue whale skeleton on display in Canada. Deck Development – see this post for details. 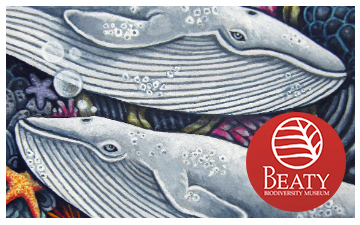 The Beaty deck features custom illustrations by five Canadian artists: Alexandria Neonakis, Lindsay Chetek, Victoria Heryet, Kyu Hwang, Derek Tan and Kyle McQueen. All organisms included in the deck can be found in Vancouver, B.C. Note that information on this webpage, primarily refers to the free print your own version of the deck. The Beaty Biodiversity Museum is a natural history museum in Vancouver, British Columbia, Canada. Its collections include over two million specimens, including a 25-metre skeleton of a female blue whale buried in Tignish, Prince Edward Island. The Beaty Biodiversity Museum and the Biodiversity Research Centre are located in the Beaty Biodiversity Centre, University of British Columbia, 2212 Main Mall, Vancouver (From Wikipedia, 30 May 2012).